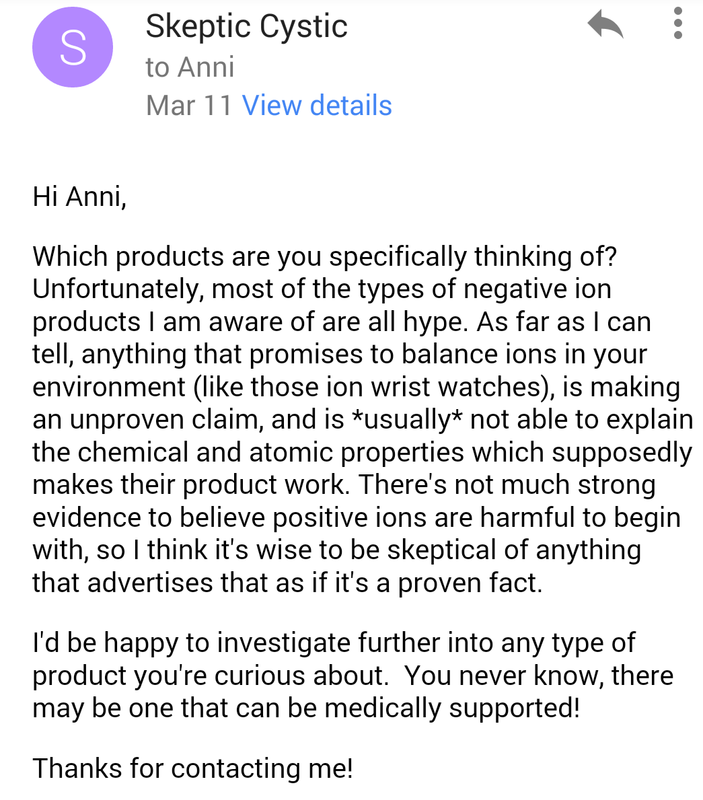 Earlier this month, a reader, Anni, emailed me to ask about negative ions. 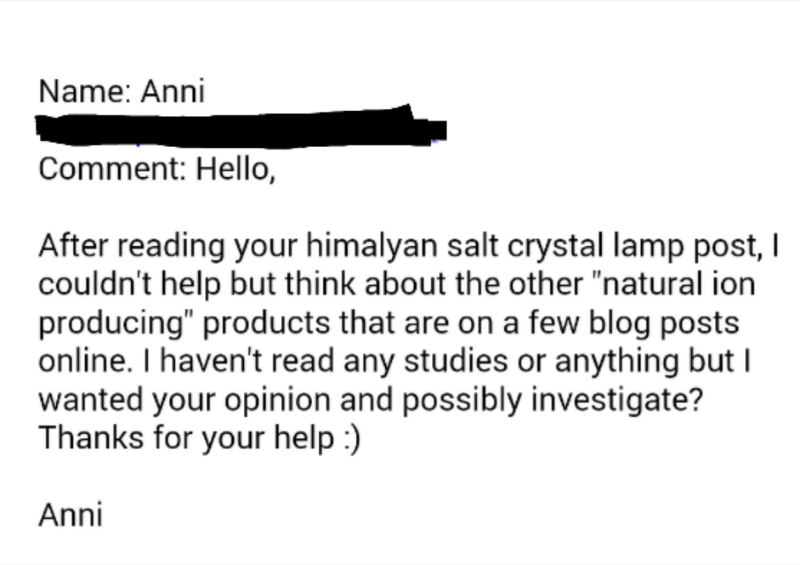 She had read my post on Salt Lamps which had piqued her interest in other products which make similar claims of cleansing the air. In particular, she was curious about a few different websites that tout natural beeswax candles as an indoor air ionizer. Kindly, she agreed to let me share our exchange and to write a more detailed post regarding these claims. I read through the links she provided, and as I suspected, the claims they were making were completely unfounded. 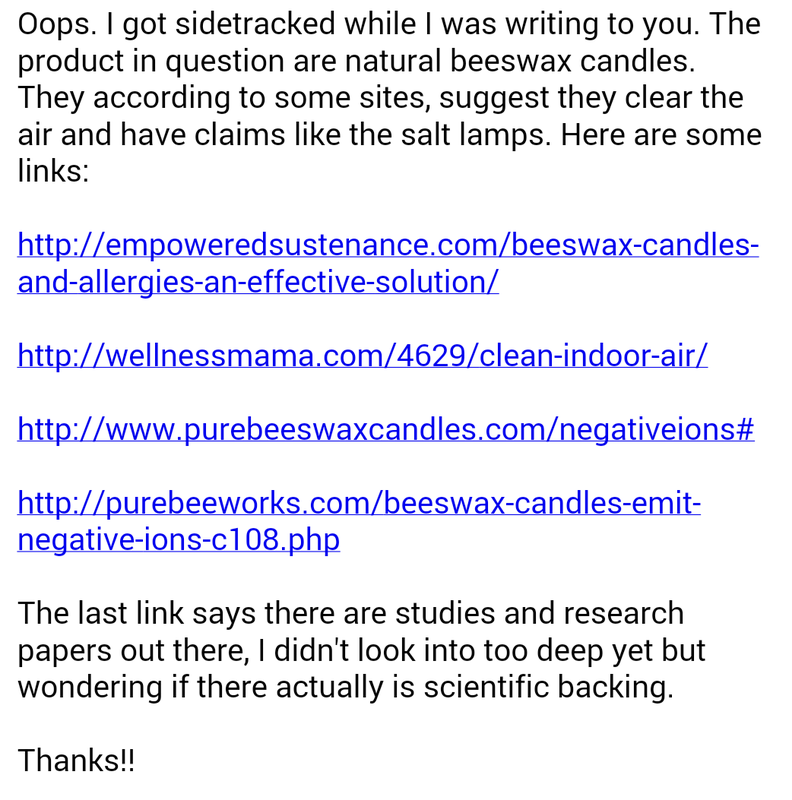 There are a few reasons I came to this conclusion, and I’d like to go through each point, as I did in my email response, to break it down further, and explain in detail why I reject claims of beeswax candles using negative ions to cleanse the air. Considering the source. The websites that perpetuate the idea of beeswax candles having mystical healing properties through ionization are all natural health websites. The reason this is a problem is because the foundation of their ideology is rooted in the logical fallacy known as the Appeal to Nature. When all the information shared is based on an emotional appeal that natural remedies are more pure and more wholesome, then evidence to the contrary will be ignored, overlooked, understated, or misapplied. Their evidence. In addition to using emotional appeals to nature or primitive wisdom to support their argument, these websites rely on unverifiable anecdotes to hold up this claim. While it might sound amazing and convincing that a woman who says her son’s asthma has not flared up at night since lighting a beeswax candle before bed instead of his usual treatments, the reader has no way of knowing if it’s true. It could be entirely made up, and if it’s not, how does one know whether it’s truly caused by the beeswax candle, or some other environmental variable, or whether it’s exaggerated, or whether the boy’s medicinal regiment has changed at all recently? Without having any of this information, it becomes no more than a nice story at best, and a baseless opinion at worse. Their references. Most of these websites or blogs do not cite their sources for their information, which is often fine for a personal blog or opinion site, but should they be expect to be taken seriously, they can’t, without credentials, presume authority over a topic and then not provide any references other than “well, duh, it just is.” That approach should raise red flags and be unacceptable to the reader who truly wishes to be informed, not brainwashed. Out of the links provided to me in the email, only one offered any assemblage of a reference section, which, upon investigating, fell flat. I ran a search through PubMed for beeswax candles and ions, and came up empty handed. I changed keywords a couple times, and still, nothing relevant. If there are “numerous studies,” they sure are elusive. Then I fell back on Google. The only results were circular blogs and websites all claiming the same thing, as if it’s a widely understood fact. Until they can link to credible sources, I can only presume this is an unsupported hypothesis. Next, I clicked the American Lung Association link. It took me to the home page, which is uninformative about matters of our focus topic. Searching that site made no mention of candles – of any type – nor did it say anything about negative ions versus positive ions. Candles.org also does not mention ionization in candle burning anywhere. It did, however, explicitly debunk a different point that was common to each site: paraffin wax candles are not toxic. The EPA website was entirely unhelpful as it caters to more general talk of air quality in cities, states, and the nation. Positive Ions Effects on the body are still uncertain. Admittedly, I wasn’t sure where this idea of positive ion poisoning came from. It seemed like it was just rumor that got passed around for so long, that it had just become part of alt-med culture and I believed there was nothing supporting it. Digging deeper though, I found a few clues as to the origin of this vague malady, and it turns out there is some legitimate research that started to confirm that hypothesis, but not enough to accept it as fact. In the late 1950’s through early 1960s, Dr. Albert Krueger and associates published several papers on the effects of air ions on various different animals, as well as human trials in the Proceedings of the Society for Experimental Biology in Medicine, and the Journal of General Physiology. Their research, now viewed as foundational to the field of studying charged particles’ effects on living organisms, seemed to suggest that an abundance of negative ions helped kill airborne bacteria, stimulated plant growth, decreased the mortality rate of mice exposed to influenza and checked the levels of the brain hormone serotonin, which is believed responsible for symptoms of migraine, nausea, respiratory distress and irritability. Most relevant to those of us with CF, his research regarding the ciliary activity in the airways showed that negatively charged ions sped up the actions of the cilia, and positive ions slowed them down. The cilia are the tiny hair like filaments in the trachea and bronchial tubes whose whip-like actions help remove particles and mucus from the lungs. In CF, this mechanism is impaired. The doctor’s research, however, led to an explosion of commercial quack devices claiming to ionize the air. It got so bad at one point, that the FDA was forced to confiscate and seize a host of ionizer machines in the 1960’s. Dr. Krueger never blamed skeptics, as he himself admitted that many of his experiments were poorly designed and controlled, but he did stand by his research until his death in 1982. Unfortunately, because of his research being instantly translated into pseudo-medical home treatments, much of the potential of Krueger’s findings were not further investigated for fear of being associated with junk science. Most of the research conducted on the topic of charged particles in the air focuses on serotonin production, as it seems the neurohormone is sensitive to the amount of negative or positive ions it is exposed to. This research has led to experimental use of ionized chambers to control pain in burn victims, as well as to treat those who have been diagnosed with seasonal affective disorder (SAD). While interesting, this sort of work is not accepted as scientific consensus yet. Some people believe in electromagnetic hypersensitivity (EHS), which is similar to positive ion poisoning, and is said to cause debilitating headaches, nausea, and mood swings. While the symptoms of EHS are very real, the phenomenon causing them can’t be attributed to electromagnetic fields, as the sufferers claim. In a systematic review published in 2005, out of 31 experiments including 725 self-described electro-sensitive subjects, there was no corroborating evidence in blind and double-blind studies to suggest it’s a real disorder. If a subject believed it could detect EMFs, he or she would have symptoms, whether or not they were really exposed to them in the tests. This is what is known as a “nocebo” effect. Candles do not carry a surplus of negative ions to be released when burned. Having established a background on ions and their real or perceived health effects, it’s time to get to the crux of the issue. Is it even possible to produce negative ions from a burning candle? Yes! But the candle is also producing positive ions. That’s because fire is an energy source hot enough to separate atoms from their molecules, at least temporarily. As they cool, the strong attraction between positive and negative rejoin the atoms in their molecular compound. This whole process happens in a tiny fraction of a second, and the gas emissions (mainly CO2 and water vapor- the same chemicals we exhale in every breath) are not ionic. So there is not a surplus of negatively charged particles to float around hopelessly looking for a partner until they are inhaled by you. Hypothetically speaking, if a flame was releasing negative ions, there would have to be positive ions being left behind. This would create an electrical charge in the flame, and eventually a spark would jump. There is somewhat of a positive charge in a flame, however, it is slight, and only measurable with sophisticated equipment. The closest species of ions we could get from a candle burning is ionized oxygen, which are free radicals. This type of free radical is different from the kind we normally think of in cell respiration (the stuff we’re always fighting with anti-oxidants), but nonetheless they could be bad for you if they were to get into your body. Fortunately, they don’t survive long after being released, and the likelihood of any significant amount entering your body is slim to none. In times past, candles – of any type – have been used as air purifiers in rooms where there’s a lot smoke, or volatile fumes, because they can consume and burn away the offending odor-causing chemical. Nowhere in the process do they release ions to cleanse the air. Beeswax is not chemically superior to other fuel sources in candles. From what I understand, beeswax candles have a higher melting point than soy or even paraffin wax, which means they will last longer, and often are more expensive. But from a gas emission standpoint, they are not any better or worse than other types of wax. Some people have made claims that beeswax produces more soot than conventional candles, but I think, like a lot of things, this varies between batches and manufacturers and is not necessarily a characteristic of the beeswax itself, as I have not been able to find any primary sources to back that up. One thing that chemists seem to agree upon is that candle burning generally carries minimal risk, no matter what type of candle one is inclined to prefer. This also appears to be a major point of misinformation, since it is a popular belief that paraffin wax, being derived from petroleum, has more toxic emissions than naturally derived wax. (I used to believe this too!). Most all credible studies have found paraffin wax exposure to be benign. While each wax has a different signature on a gas chromatograph, none appear to emit a more hazardous composition than another. A large international study investigating emissions from multiple types of candles found that even the worst offenders fell well below a harmful level of exposure. Unfortunately, chemophobia and a hatred for all things petroleum have distorted the perceptions of much of the general public, and the media reporting that sensationalizes it. Ultimately, which candle you buy is a personal preference, as there’s not a clear superiority to any type. Candles can be very relaxing and very beautiful. 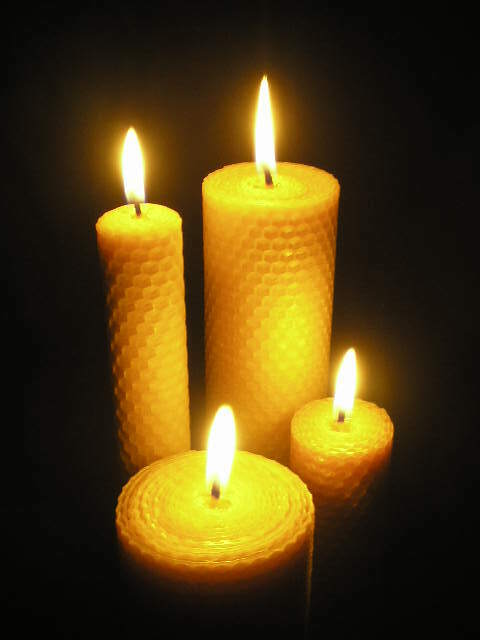 Many people prefer the natural scent of beeswax candles, over other types of added fragrance. Inherently, there’s nothing wrong with burning candles to set a mood (in a safe and reasonably ventilated area, of course). I would steer clear of anyone trying to justify an extra cost of beeswax candles with pseudo-medical claims though, because they are either lying, or are grossly ill-informed. Thank you again, Anni, for bringing this to my attention. I hope my explanations were clear and helpful! For what it’s worth, the best information I have found suggests that HEPA Filters are a person’s best bet for air purification.